In today's knowledge-driven world, literacy, numeracy, and the ability to use digital technology are foundational to socioeconomic success. However, when it comes to these skill areas, immigrants in the United States lag behind their native-born counterparts. MPI analysis of data from the 2012 Program for the International Assessment of Adult Competencies (PIAAC), a survey that assessed the cognitive skills of adults (ages 16 to 65) in 24 Organization for Economic Cooperation and Development (OECD) countries, finds that immigrants are over-represented among low-skilled adults in the United States—accounting for 33 percent of adults with low literacy skills and 24 percent of those with low numeracy skills while comprising only 15 percent of the overall U.S. adult working-age population. 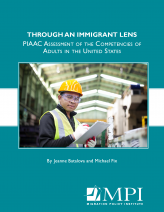 This report uses PIAAC data to describe the English literacy and numeracy of adults in the United States and explore how these skills are related to key outcomes such as labor market participation, income, and health status. The detailed analysis reveals a number of findings regarding immigrants and their U.S.-born adult children, which taken together underscore deep social inequalities. Roughly 40 percent of immigrant adults lacked basic English literacy and 48 percent lacked basic numeracy in English. The authors point out that the PIAAC competency tests are administered in English, leaving non-English speakers at a disadvantage—regardless of their skills in their native language. While native-born adults in the United States outperformed immigrants on the PIAAC survey, both groups scored well below international averages. The overall U.S. scores were only marginally affected by immigrants' low scores, the MPI researchers found. The test results show that between half and two-third of all U.S. working-age adults were not proficient in literacy and numeracy. Even among those with a college degree, 22 percent of natives and 54 percent of immigrants scored below proficient in literacy. The report suggests that the rising skills of new entrants to the United States, patterns of intergenerational progress, and the high workforce participation of immigrants could offer levers for future improvement. In particular, the report notes that work-based language and skills training programs—which are proven to significantly improve participants’ employment prospects and increase their earnings—could reach many adults with low literacy levels. Yet low-skilled individuals, regardless of their birthplace, are less likely to have access to these programs for a number of reasons, including cost, language barriers, lack of information, and competing work and family demands.